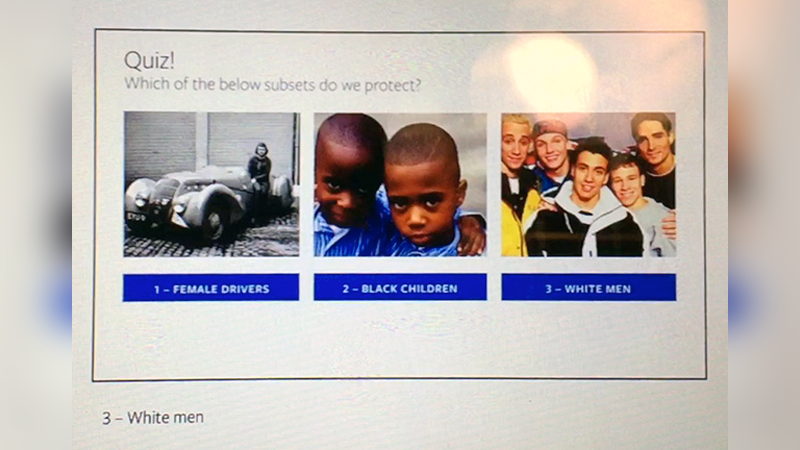 Facebook only blocks inflammatory remarks if they’re used against members of a “protected class.” But Facebook itself decides who makes up a protected class, with lots of clear opportunities for moderation to be applied arbitrarily at best and against minoritized people critiquing those in power (particularly white men) at worst—as Facebook has been routinely accused of. So “White men are assholes” is unacceptable on Facebook because race and gender are protected. “Christians are assholes” is verboten because religious affiliation is protected. “Christianity is for assholes” is fine because religions themselves can be critiqued and no specific demographic is targeted. And “Black children are assholes” is allowed because “children,” a group categorized according to age, are not protected. White men are considered a group because both traits are protected, while female drivers and black children, like radicalized Muslims, are subsets, because one of their characteristics is not protected. As the leaked slides recreated by ProPublica (presumably out of caution) reveal, Facebook lists only three scenarios where inflammatory speech against subsets aren’t allowed: calls for violence, calls for exclusion and calls for segregation. But enormous loopholes let people disregard all three. Facebook is neither bound by the First Amendment nor legally required to police hate speech. But, in its current approach, the company is ignoring its ostensible mission statement to “give people the power to build community and bring the world closer together.” Facebook knows full well that online communication is only the first step for people to go out into the real world and actionize the beliefs that tie them together. So reducing hate speech to an LSAT prep semantics game reframing hate and hate groups as “just” words is dishonest. Ultimately, balancing freedom of expression with combatting hate speech for 2 billion users will require a much more robust, complex approach.